Junkrat’s defense capabilities consist of a grenade launcher with bouncing frags and a concussive mine that can propel both he and his enemies into the air. Frag Launcher: A grenade launcher with a fair range of fire. Each grenade he lobs can bounce off of surfaces to eliminate enemies around corners or in hard to reach places. Concussive Mine: A trigger mine that can send enemies into the air with heavy damage, or can propel Junkrat to hard to reach areas and chokepoints. Steel Trap: A large metal bear trap that if an enemy steps over, will lock them into place making them an easy target. Total Mayhem: With this ability, Junkrat drops live grenades when he falls in battle. Useful for some post-mortem vengeance. Rip-Tire: A motorized controllable bomb that delivers massive damage upon triggering it. This can easily be used to take down a group of weakened enemies. It can also climb over walls and obstacles, allowing for you to take down targets wherever they are hiding. You should never stray into open areas or street brawls with Junkrat, and instead, focus on close range fights to succeed. You can target your enemies anywhere from close to medium range, and shoot grenades into the air can prove a successful method of health reduction for an oncoming team. Your best bet will be close range point control, where you can lob frags with reckless abandon, and cause splash damage to multiple enemies if they are in close proximity. Use this in tandem with your Steel Trap, to stop an encroaching enemy in their tracks. Placing a trap at the entrance to a room, and a mine at the other is a fantastic means of point control, as either way your enemy will be a prime target for sustained damage and a quick end. Keep in mind your grenades will bounce 3 times before exploding unless an enemy walks into them. This means you can bounce them off walls from a secure location. You may also want to try to reach higher ground, and can do so by placing your mine and triggering it while you stand over it. This will boost you up into the air enough to reach higher ground. Bounce grenades off of objects to attack opponents around corners, and use your mines to propel yourself skyward to reach more advantageous positons. Bastion: With Junkrats frag launcher, a stationary Bastion Sentry is easy pickings. A few well-placed grenades can eliminate Bastion before he can transform or heal. Reinhardt: Though his shield will deflect Junkrat’s frags, you can shoot the grenades over his shield to take his health down. A well placed Steel Trap can also hold him in place long enough for you to eliminate him. Reaper: Reaper can use his Shadow Step ability to dodge all of Junkrats attacks while closing in for the kill. Pharah: Considering Pharah spends most of her time in flying through the air, or hovering a few feet off the ground, she can easily get around all of Junkrats ground-based abilities. It’s possible to hit her with a frag, but her maneuverability makes her a tremendously difficult target. 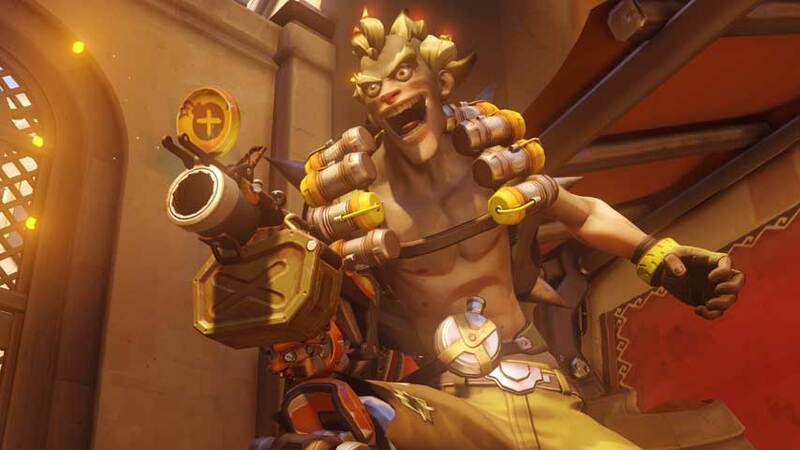 Junkrat is an explosives-obsessed freak who lives to cause chaos and destruction. The attack on the Australian omnium's fusion core forever altered the landscape of the Outback. After the detonation, the area was transformed into a harsh, irradiated wasteland, littered with debris and the twisted fragments of the ruined facility, and unlivable to most. But there were some who survived. Calling themselves the Junkers, they scavenged the husk of the omnium and formed a lawless, cutthroat society in its shadow. Junkrat was one of them, eking out a living reclaiming metal and components from the ruins. Like many others, he was affected by the lingering radiation. This touch of madness made him ideal for handling dangerous explosives, a love which he turned into an obsession. He came to notoriety when he discovered an extremely valuable secret in the bones of the omnium. Though few knew the nature of what he found, he was nonetheless pursued by bounty hunters, gangs, and opportunists wherever he went, until he made a deal with the Junker enforcer Roadhog, who grudgingly agreed to be his personal bodyguard in exchange for a fifty-fifty share of the spoils. Now, with Roadhog in tow, Junkrat has left the Outback, and embarked upon an international crime spree leaving nothing but havoc and bedlam in his wake.